HARRISON, N.J. — Daniel Royer scored twice in a 2:44 span late in the second half, and the New York Red Bulls advanced to Major League Soccer’s Eastern Conference finals with a 3-0 win over Columbus on Sunday night that overturned a first-leg deficit and likely will free the U.S. Soccer Federation to hire Crew coach Gregg Berhalter to run the American national team. New York won the two-leg playoff on 3-1 aggregate and will play Atlanta United in a two-leg semifinal on Nov. 25 and 29. The Eastern winner meets Portland or Kansas City in Major League Soccer’s final on Dec. 8. Alex Muyl scored in the 17th minute to wipe out Columbus’ advantage from Gyasi Zardes’ second-half goal in the opening leg. 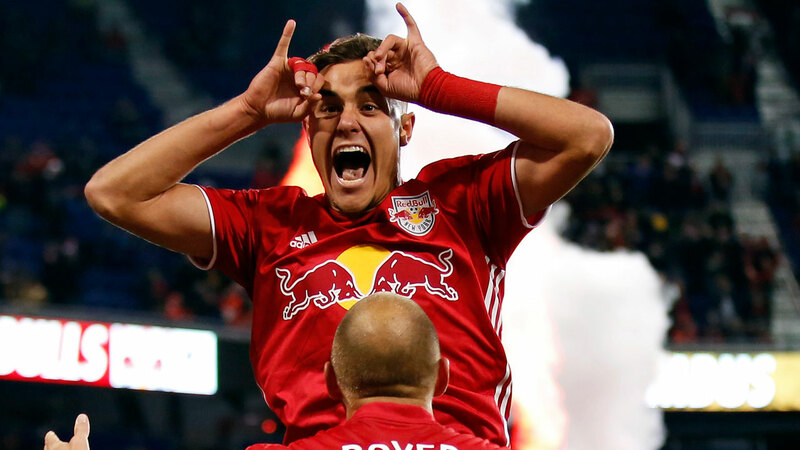 Royer, an Austrian winger who had 11 goals during the regular season, gave New York the aggregate lead in the 73rd after Muyl played the ball from foot to first in the arc and played the ball left to Tyler Adams, who found Royer open near the penalty area with a through pass. The Empires Supporters Club behind the goal set off red flares, and there was still smoke over the field when Alejandro Romero Gamarra fed Royer off a counter in the 73rd. With Red Bull Arena just two-thirds full on a night with a kickoff temperature in the low 40s, New York evened the aggregate after Sean Davis sent a free kick from 35 yards on the right flank into the penalty area. Royer headed the ball down and defender Aaron Long kicked it toward goalkeeper Zack Steffen from 7 yards. The ball deflected off Muyl and possible off defender Jonathan Mensah for the 23-year-old midfielder’s first playoff goal. New York had more energy than Columbus, which could have moved into a commanding position by scoring an away goal, which is a tiebreaker if the aggregate is even after regulation. Berhalter, in line to become the first player to appear in a World Cup for the U.S. and coach the national team, is the favourite to replace U.S. interim coach Dave Sarachan, who has led the Americans for 13 months since Bruce Arena quit after they failed to qualify for this year’s World Cup. In his fifth season coaching the low-budget Crew, Berhalter led Columbus to the playoffs four times, losing to Portland in the 2015 final and getting eliminated in the 2017 conference finals and 2014 conference semifinals. In dark pants, shirt, jacket and shoes, with a dark scarf, he dressed in the style of Pep Guardiola. Columbus, which beat the Red Bulls in the 2008 final, was in danger of being moved to Austin, Texas, for 2019 before Major League Soccer announced Oct. 12 that owner Precourt Sports Ventures intends to launch an expansion team in Austin and the league is working with the Haslam and Edwards families to keep the team in Columbus.